Invite the blessings of Lord Ganesha, who is the remover of obstacles with these specially made Ganesha incense sticks. Fill your surroundings with divine aroma of Orange, Lavender, Lemon, Chamomile and Petitgrain and usher in the blessing from the Lord who is the icon of good luck and promotes auspicious beginnings. 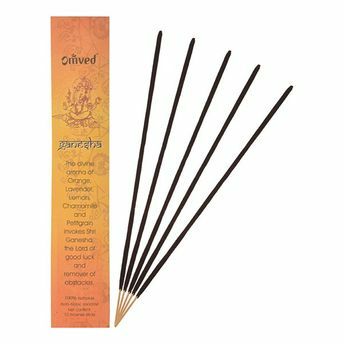 Omved's Ayurvedic incense are made in the ancient, traditional way with a 'masala' or mixture of 100% natural aromatic botanicals (no charcoal) are rolled into natural bamboo sticks as compared to 'dip incense' in which sticks of charcoal are dipped into synthetic fragrance or essential oils. Infused with the abundance of nature these aromatic ingredients combine to produce a smooth, slow-burning incense. The result is a fresh and fragrant breath of conscious bliss.